On a clear May afternoon at the end of his junior year at Harvard, Howard Axelrod played a pick-up game of basketball. In a skirmish for a loose ball, a boy’s finger hooked behind Axelrod’s eyeball and left him permanently blinded in his right eye. A week later, he returned to the same dorm room, but to a different world. A world where nothing looked solid, where the distance between how people saw him and how he saw had widened into a gulf. Desperate for a sense of orientation he could trust, he retreated to a jerry-rigged house in the Vermont woods, where he lived without a computer or television, and largely without human contact, for two years. He needed to find, away from society’s pressures and rush, a sense of meaning that couldn’t be changed in an instant. Howard Axelrod’s essays have appeared in the New York Times Magazine, Salon, Virginia Quarterly Review, and the Boston Globe, among other publications. He has taught at Harvard, the University of Arizona, and currently teaches writing at Loyola University in Chicago. 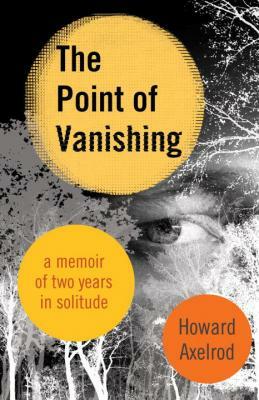 His debut book, The Point of Vanishing: A Memoir of Two Years in Solitude, evocatively chronicles his experience of retreating into nature following a basketball accident that left him permanently blinded in one eye. The memoir was named one of the best books of 2015 by Slate, the Chicago Tribune, and Entropy Magazine, and one of the best memoirs of 2015 by Library Journal. In a starred review, Kirkus called the book a “vibrant, honest, and poetic account” of Axelrod’s search for quiet and for a different, more internalized and introspective way of seeing.